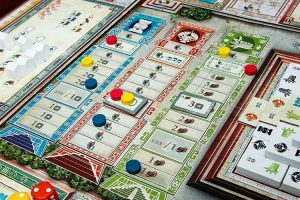 We review Teotihuacan: City of the Gods, a resource manamgent and worker placement game published by NSKN Games. 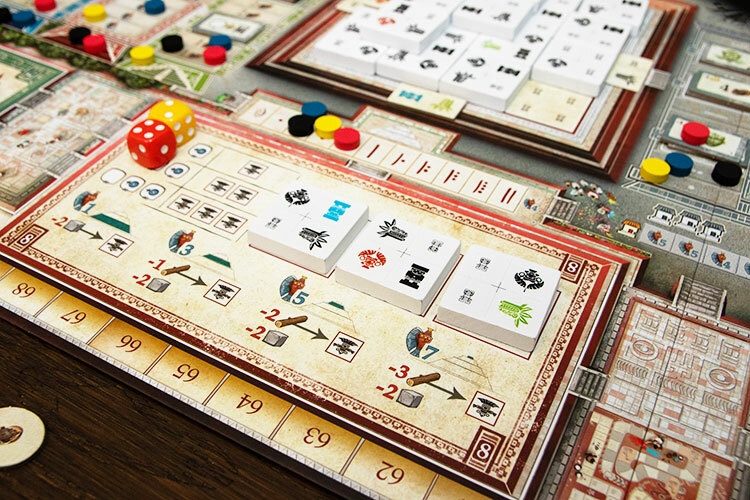 In Teotihuacan: City of the Gods, players are trying to earn the most points building this ancient city over the course of the games three ages. The buzz or lack thereof, from the Essen Spiel fair this year was the lack of a real standout title that everyone agreed was the must-have game of the show. With over a thousand new games released it’s certainly hard for anything to rise above the fray. 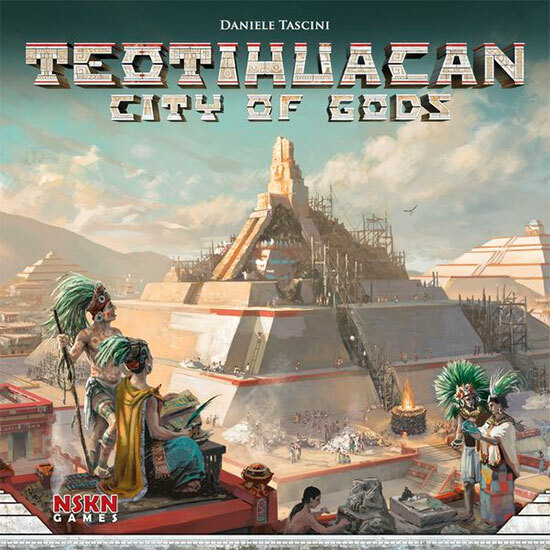 But perhaps the game with the best pedigree, at least as far as euro gamers are concerned, was Teotihuacan: City of the Gods from designer Daniele Tascini. 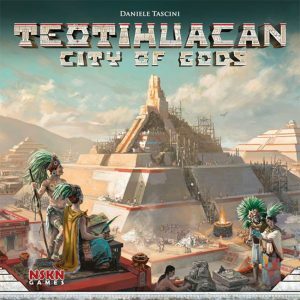 So now that the dust has settled a bit from the throng of thousands of games, is Teotihuacan worth taking another look at? 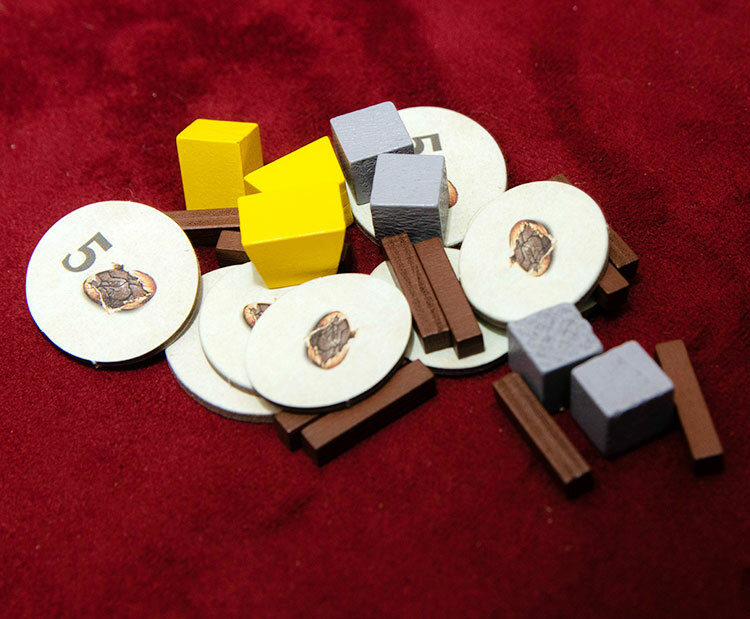 Teotihuacan is a worker placement and resources management game for 2-4 players. It plays best with 4 players and takes about 2 hours. 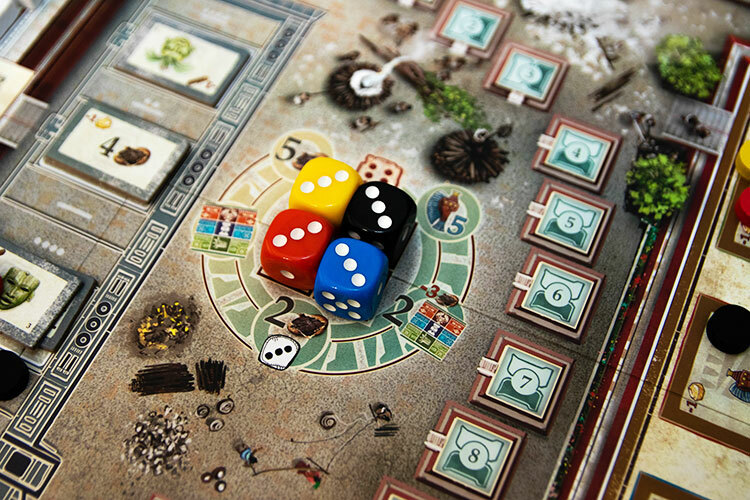 In Teotihuacan, players control workers building the ancient city and its prominent pyramids. Most of the gameplay centers around gathering resources and using those to contribute to a community-built pyramid. There are also individual technologies to unlock, temples to worship, and build houses for the city’s population. The game is played over three rounds with scoring taking place after each. You’ll choose one of these bonuses each time a worker ascends. Each player starts with three dice, which will start at a value of 1. There are 8 sections around the outside of the main board, each associated with a specific action. On your turn you can move a die up to three spaces and take the action for that space. Your actions become more powerful if you have additional dice already on the space, or use a higher-value die. After you complete the action, you’ll increase the value of the die, as that worker gains “experience” and is now able to perform actions more effectively in the future. The three main resources—wood, stone, and gold—are used to build pyramid tiles and decorate the steps of the pyramid. A fourth resource, cocoa, is the main currency of the game. If your worker ends on a space where other dice are already present, you must pay cocoa based on the number of different players already on that space. This can make many areas of the board incredibly expensive as dice tend to congregate actions. Once you’ve collected enough resources you’ll want to start helping to build the structures throughout the city. The pyramid essentially has two parts—the white tiles which make up the bulk of the structure and the step tiles which are placed on the four sides. The white tiles reward victory points based on which level it is built at. You also receive bonus victory points if the symbols on your tile cover up a matching symbol. Resources are spent on building pyramid tiles, adding decorations, and developing technologies. Finally there are technologies you can unlock to give you additional benefits throughout the game. These also cost gold but can be quite powerful. For instance, some will give you additional resources any time you collect resources while others will give you discounts for building part of the pyramid. Any time you have a worker who would progress from a value of 5 to 6; they instead ascend and are reborn as a cute baby 1-value dice in the palace. You do reap some benefits as you move up the Avenue of the Dead track, which scores points each round and you get a one-time bonus of your choice. Each scoring phase is a slightly indeterminate number of rounds. The countdown progresses after the last player’s turn every round, but also moves forward any time a worker ascends. Once the eclipse counter has been reached, players will finish the round and play one additional round before scoring. Points are scored based on contributions to the pyramid, progress on the avenue of the dead, and collection of mask tiles that can be acquired on various sections of the board. After the third scoring, the game ends, and the player with the most points is the winner. Players will all contribute to building the central pyramid. If it seems like there is a lot going on in Teotihuacan, it’s because there is. This is a game of interconnected mechanisms that require diligent planning and thoughtfulness, but rewards its players with a deep and engaging experience. Every action you want to take in Teotihuacan requires you to make a number of calculations before you even think about moving your worker. Most obviously—do you even have the cocoa to use that action? Hopefully yes, but then you have to determine based on the number and values of your dice if the action is really going to accomplish what you want. If you send a paltry single 1-value die to the forest they’re going to somehow come back with a single cocoa rather than the wood you’ve sent them after. So you’ll often have to plan a bit further ahead, setting up turns where your dice can meet in the same location, offering a much bigger reward. Three different temple tracks give you bonuses as you worship the various temples. Then, after taking out the action, which die are you going to level up to its next value? There is a trade-off between quickly progressing one of your workers compared to spreading that experience amongst all of them. 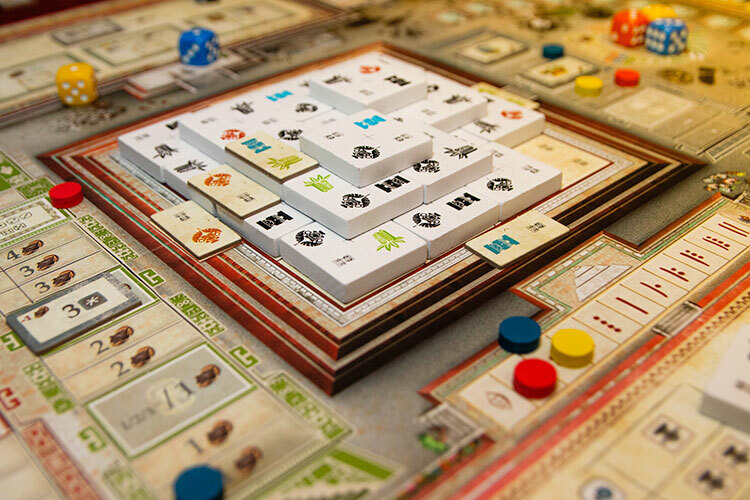 These additional decisions are easy to miss the importance of in your first plays but are really where the depth of strategy comes from in Teotihuacan. You’ll also have to think about the various temple tracks, each with its own rewards. However there are also end-game bonuses if you reach the top of a track, which means you are better off focusing on one or two of them rather than spreading your worship around all of the temples. Teotihuacan has been often compared to designer Daniele Tascini’s previous game T’Zolkin. While it shares some similarities, there are significant differences that I believe make Teotihuacan a better experience. While planning a couple moves ahead is clearly part of the path to success in both games, Teotihuacan doesn’t require the precision timing of T’zolkin. There are less feel-bad moments from when you miscalculated—no gears are going to turn too far for you to get what you were wanting here. In addition, Teotihuacan has a significant amount more player interaction. While you can’t necessarily fight directly with your opponents, you are battling over position on the temples, building a communal pyramid, and collecting or paying cocoa based on the location of everyone’s workers. There may still be some shouts of multiplayer solitaire, but for me, there is almost the perfect amount of passive interaction allowing you to think about what you opponent’s plans are without worrying about them somehow ruining all of your hopes and dreams. Developing along the Avenue of the Dead scores additional points every scoring round. 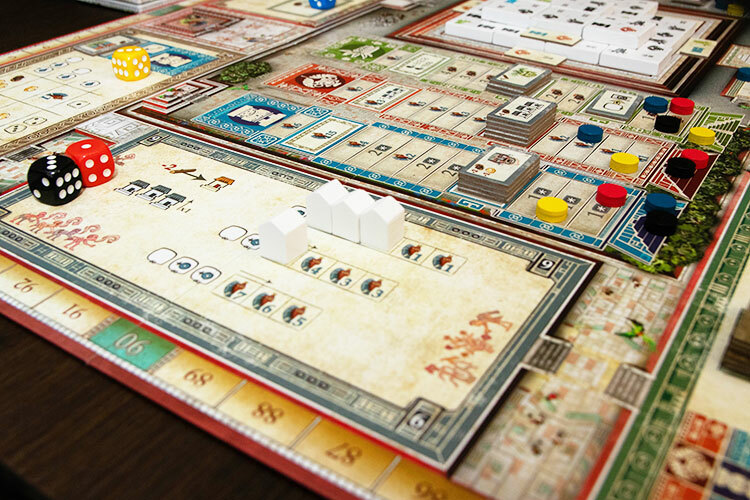 The game board is pre-printed with the recommended setup, but the box includes a plethora of cardboard to mix up the game as you become more experienced. You can change the order of the various action boards, the available technologies, the end-game scoring for the top of the temple tracks, and the palace actions. This allows you quite a bit of variety and mixing up some of these can really change the feel of the game. Teotihuacan isn’t necessarily a game of multiple paths to victory as much as just trying to be as efficient as possible. You can try to build a bit of an engine and do more pyramid or house building than other players, but you’ll likely have to do a bit of everything. After multiple plays I do have some concerns that the technologies, especially the one that gives you extra resources, are almost a necessity. Using the randomized technology tiles make it possible that this one isn’t available, but you’ll still want to invest in at least some technologies. It also is at its best with the full complement of four players, as you’ll have to put some “blocking” workers out between rounds with less. At three this isn’t a huge problem, but as a two player game, you lose quite a bit of the interactions. The number of pyramid tiles you can build depends on the number of dice you have on the action board. Teotihuacan: City of the Gods is very easily in my running for game of the year of 2018. While the structure of the game maybe boils down to a giant rondel, the interconnected mechanisms really make this game shine. All players have to compete over the same actions, racing to take them first, managing the experience of their workers, and worshipping to the right temples at the right times. It is by far my favorite of Tascini’s designs and coming from someone involved in both T’Zolkin and Voyages of Marco Polo, that’s something. Every play of Teotihuacan so far I’ve had something surprising happen. And the majority of those plays are with the preprinted board, so there are near infinite combinations awaiting that can change the game up in minor, or major, ways. 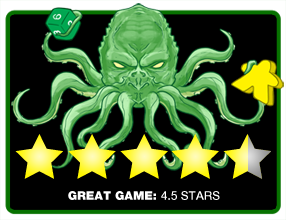 Final Score: 4.5 Stars – Great heavy euro with lots of replay value and a contender for game of the year. • Lots of depth of strategy, requiring careful choices throughout. • Just the right amount of player interaction without ever feeling mean. • Recommended setup preprinted with lots of options for variety. • Less fun as a 2 player game. • Technologies are kind of a must have, limiting a few rogue strategies.